"You know the good thing about food - it brings people together." 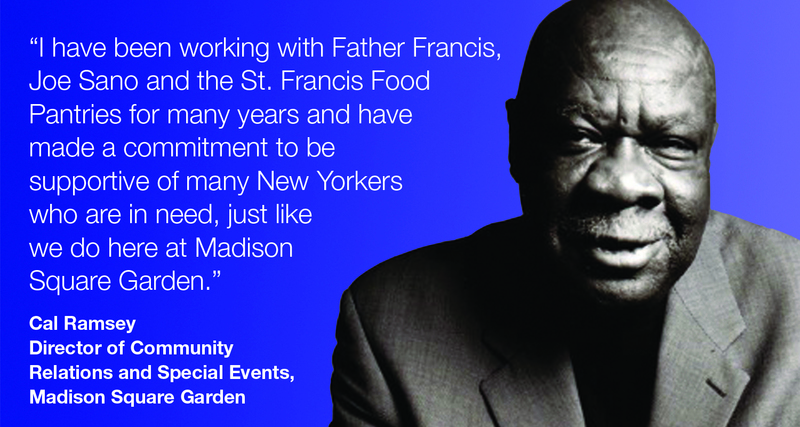 St Francis Food Pantries and Shelters are spread throughout the New York area and we were busy! The levels of giving continue to increase at all of our pantries; we have yet to see a fall off to those in need. This Spring, our efforts at St Francis Food Pantries and Shelters remained focused on food; a staple to our lives. But this is just a starting point for people to gather and gain nutrition, it also brings people together to be a family. While food is nourishment for the body, it is also sustenance for the soul. St Francis Food Pantries sponsored an Easter Party at Oasis - A Safe Haven for Women and Children, helping bring families together to enjoy the holiday with family and good food. 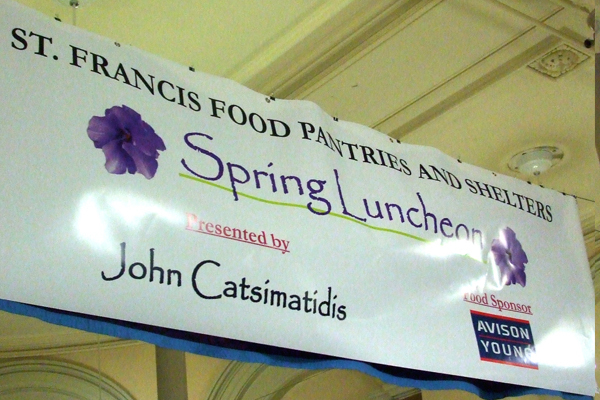 Over the years, John Catsimatidis has been a good friend to St Francis Food Pantries and Shelters. In May, John sponsored the "Spring Luncheon" at the Welcome Table Soup Kitchen on 15th Street. The Welcome Table is a special soup kitchen in the St Francis network that provides for the homeless in Manhattan, not only food but a true respite for the weary and an opportunity to be with others. "Motown" was the Broadway play for our 13th Annual Theatre Benefit. Over 1100 supporters attended the event which honored Carl Toriello, President and CEO of Jefferies Finance LLC and James Reeves, Head of Capital Projects at Barclays. Over $800,000 was raised to support the St. Francis Food Pantries and Shelters. Cinco de Mayo is a celebration of Mexican heritage and pride in America. Parties were thrown at our pantries that serve people of Mexican descent. "Home is where your mom is." And for Mother's Day, St Francis Food Pantries and Shelters held events honoring mothers, grand mothers and even great grandmothers at many of our Food Pantry locations. The Ralph Lauren Foundation hosted more "Peanut Butter and Jelly Sandwich Days". Over 100 volunteers made over 4500 sandwiches which were distributed to four feeding programs in our network. Hundreds of cases of food were purchased and delivered throughout the many locations we support. Again, we were able to send over 200 students from St. Vincent Ferrer High School to see a production of "The Little Flower" - a play about the life of Mayor Fiorello H. La Guardia. Starring our good friend and supporter, Tony Lo Bianco's one-man play that relived La Guardia's last day of his three-term administration as NYC's Mayor. Our continued efforts to make a difference to the poor, to the children and to families within our network, can only be continued with the unbelievable support from our patrons. We can't thank you enough!